Customers don't use scripts, so why should your support team? In today's customer-centric world your customer service team should be empowered and trusted to have real one-on-one conversations with your customers. Customers know when you are using a script, and they don't like it. 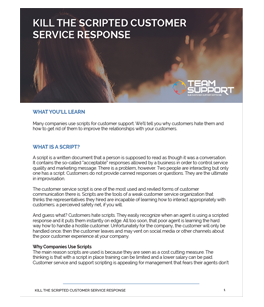 Scripts for customer service are impersonal, irritating to customers, and demotivating to your customer support team..